Gradient and Eyedropper – Paul Casper – Creator. Educator. Leader. Have you ever wanted to sample a specific color from an object or photo in Adobe Illustrator with the Eyedropper tool and apply it to a color stop on the gradient slider? If so, you’ve probably discovered there’s no obvious way to do so. 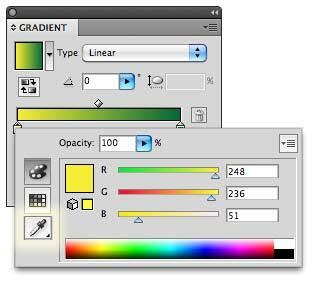 Select the object on which you want to change the color of the gradient. Select the first color stop in the gradient that you’d like to change (I selected the white one first). Hit the “i” key or select the Eyedropper tool in the tools panel. Hold the SHIFT key and click the color of the photo or the object that you’d like to sample with the Eyedropper tool (I chose yellow). Repeat for any of the other color stops in the gradient (In this Case, the green). Wouldn’t it be nice if we could select the eye dropper right from the gradient panel? I would propose something like this so it’s obvious and consistent (by double-clicking on a color stop).